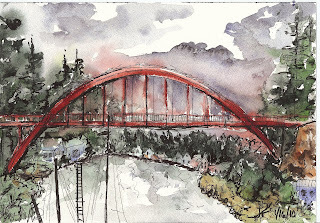 Same day as last painting-we drove back across the Rainbow Bridge and found a place to park where we could see the whole bridge (still sitting in the truck, as the rain had stopped, but it was getting really cold as the sun went down.) This small painting (7"x9") was done wet-in-wet, then I went back in with black ink. The vibrant dark red orange of the bridge contrasts so beautifully with the very dark green evergreens- someone had a real eye for color when they selected the color for the bridge! I used brown madder-it was the perfect color right out of the tube. The sun was setting so quickly that I had to work quickly. Painting en plein air in that climate is very different than in San Jose. Here, the paper dries so quickly sometimes that it's difficult to get colors to mix. On the wet Washington coast, it took forever for the paper to dry. My sister, not a watercolorist, was becoming alarmed as the paint kept running, but I'm happy with the way everything blended. All of your new paintings are terrific! I especially like this one, I hope you plan to do a larger painting of this subject. Glad your back! !